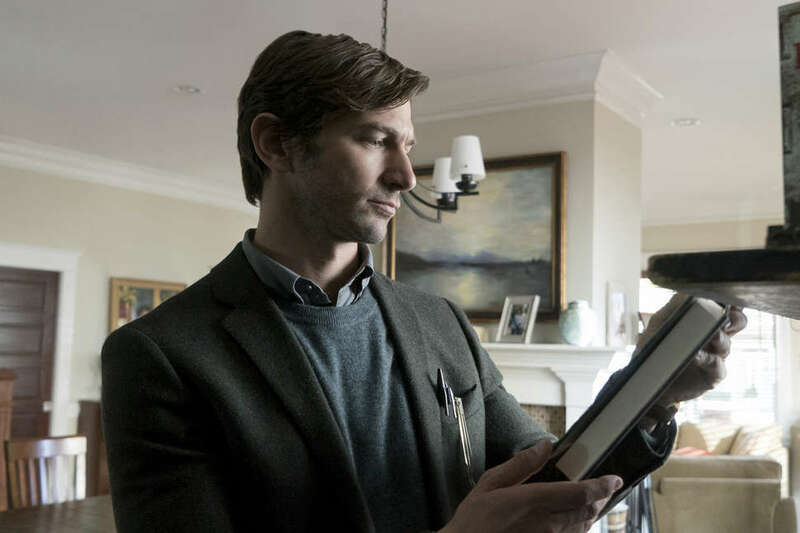 Michiel Huisman doesn't want to be the one to spoil The Haunting of Hill House for you. 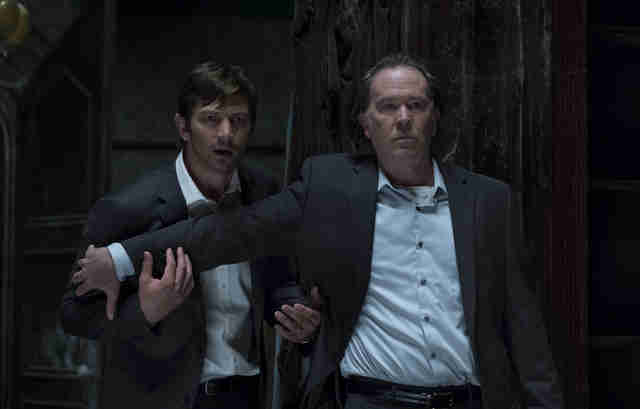 The actor, who plays Steven, the eldest of the five Crain siblings on the Netflix horror series, has been watching the episodes with his 11-year-old daughter and giving her warning taps when anything scary is about to come up on screen. "Every now and then, I'd get so invested in the story, I'd forget to tap!" he confessed in a recent interview with Thrillist. "And then she'd be like, 'Why didn't you tap?! You know this! You were there!'" Our version of the tap is this spoiler warning, which Huisman, who you also know as Daenerys Targaryen's hunky former paramour Daario Naharis, asked us to provide even though there are only light spoilers ahead. There are a lot of really cool Easter eggs in the show, including all the hidden ghosts that viewers might not see on a first pass. Yeah! Most of it is not added in post-production but was a practical effect, so often I knew when it was happening. A lot of it was subtle stuff, like where the camera goes into a room, you pass a statue, the camera comes out of the room, and the statue is looking in a slightly different direction. Somebody was standing there who quickly changed the statue. And it was the same with all of the ghosts in the background, who are hiding in the shadows, literally. It's going to be so fun, because it's going to be like, "Did you find the 30 ghosts in Episode 2?" I'm curious to see how that's going to play out. How did that affect you while you were shooting? [Showrunner] Mike Flanagan basically told us from the beginning that whenever we're at shooting on the set of Hill House, we would have a couple of ghosts on hand, in full makeup. They're house ghosts. And whenever we could, if there was a lamp they could hide behind, we'd do it. So that was really cool! Sometimes, all of a sudden after take four, I would look around and finally see someone, and I'd be like, "What?! Has that person been standing there the whole time?" Has anyone told you this already? We built our interior house set following a floorplan like a real house would be. You could take the hallways. You could go upstairs. And all of that is very uncommon. Usually, you're just in a studio stage, and on one side of the stage might be the kitchen, and on the other side might be the living room. This way, the way we did it, was like a maze. You could literally get lost in this house. But you could also move from room to room with a camera, without cutting. It all adds to the experience of being in a scary house. And the exterior of the house, that's a real place. It's a rural house in Georgia, like an hour outside of Atlanta. It's for sale now. [Laughs] I don't know if being in a haunted house show is going to be good for the sale! But that's the exterior that you see in the poster. And our set, we built to somewhat resemble the interior of that house, but also to fit our needs. At least they don't have to disclose that it's haunted. But you don't believe in that, do you? In my personal life? No. I'm pretty skeptical. That's what was easy to relate to about my character. But I went to a psychic once, for fun, here in New York, actually, before I lived here. I think it was about 13 years ago now? That was a weird experience. I still don't really believe that the psychic was able to read me. She made a very good guess. She said something like, "You're juggling two careers." And I was -- acting and music. And I was at a point where I felt like I had to really choose between them, but no one had really formulated it that way to me. So I'm thankful for that. It helped me decide. But do I believe in ghosts or haunted houses? No. I don't. And neither does my character. He is totally convinced that his family is suffering from some form of mental illness, and that explains everything they see. But that theory only gets him so far. And that theory causes him to get a medical procedure which disrupts his relationship with his wife. He doesn't want to pass along mental illness. But he could have also discussed that with his wife. Yeah. But that's also what makes him human! And that's something I really appreciate about Mike's writing, not just in regards to my character, but all the characters in the show. The whole Crain family is very fleshed out. And if you look at my character, he seems to be the only one on the top of his game. He's very successful. But that façade is so thin, because his success came at such a high price. He sold out his family, and they basically hate his guts, for writing a book about their childhood trauma. And the fact that he's so convinced that his family is suffering from mental illness is what makes him scared. It's why he never had the guts to tell his wife. I think this is one of the best psychological or emotional reveals for my character. I'd hate to give that away too early. But I love that, you know? It's like his flaw is that he doesn't listen. He's dismissive of Abigail, thinking she must be Luke's imaginary friend, just because he hasn't met her. Did you ever want to talk some sense into him? I could really relate to our dad in the story trying to fix up the place and move on to the next, because we've fixed up many different places. Houses have fallen apart around me! [Laughs] That's one of the reasons we said goodbye to the place in New Orleans, because we were only there for a couple months out of a year, we were traveling so much, and by the time you come back home, you have to start all over again, fixing up the back of the house and that kind of stuff. I'm not good at home renovation, but I love doing it. I love the instant gratification of fixing something. That's something I don't get a lot in my work, because there's always so much more involved. You work on something, and it comes out a year later, and it's been edited. I only have so much control over it, and I'm a bit of a perfectionist. And the problem with do-it-yourself stuff, you only get good at it with a lot of experience. So often have I fixed a little hole in the wall, and then stepped back to look at it and gone, "Geez, I should have paid someone to do it." You shot a lot of behind-the-scenes photos while filming. There's more control with that, right? Yeah. And I'm going to unleash that onto the world. But that's an example of where I can get a little bit of instant gratification, because I can do it all myself, especially when it comes to shooting analog. I started developing and printing myself this summer, and it's a physical thing, which I like, because acting is always in my head. Although you should be careful. On the way here, I heard on the news that 259 people had died this last year taking selfies. They put themselves in a dangerous position, and don't realize it.